Have you been to Vegas lately? I sure haven't... the last time I was in Vegas was for a Marine Corps ball when Kenneth was still active duty, many, many years ago! If you are like me and aren't able to make the trip to Vegas as often as you might like, at least you can recreate some of the dishes from the fine dining available there! 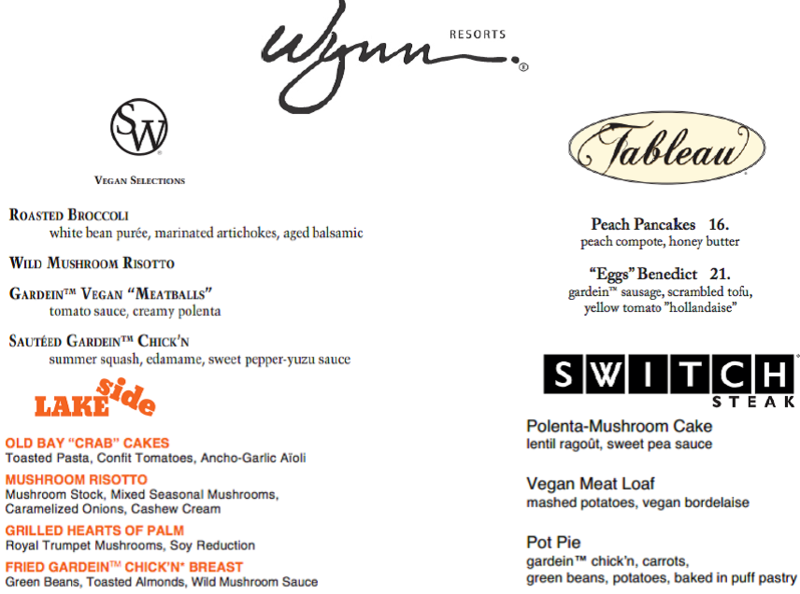 I was sent the vegetarian sample menu items below from some of the Wynn Resort restaurants, and I chose to recreate the Wild Mushroom Risotto from SW Steakhouse. There were many delicious looking and sounding recipes to choose from as you can see - I'm pretty sure I'll be attempting the Peach Pancakes, Eggs Benedict, and the Pot Pie in the near future. I have never made risotto before so I was excited to find a good recipe and give this a try and see how it would come out for me. This risotto recipe is wonderful!! Cooked slow and low to give you tender, but slightly firm risotto infused with delicious baby portobellos and a Mediterranean flavored Parmesan cheese. Absolutely wonderful! I loved how creamy the final dish was, and the flavor of the mushrooms was so, so good. My husband in particular really liked this one - he probably ate over half the finished recipe on his own! We ate this dish by itself the first night, and then alongside some gorgeous steaks the next night. Absolutely wonderful as an entree or a side dish. You can't go wrong with this one! Add 1 tablespoon olive oil to skillet, and stir in the shallots. Cook 1 minute. Add rice, stirring to coat with oil, about 2 minutes. When the rice has taken on a pale, golden color, pour in wine, stirring constantly until the wine is fully absorbed. Reduce heat to medium. Add 1/2 cup broth to the rice, and stir until the broth is absorbed. Continue adding broth 1/2 cup at a time, stirring continuously, until the liquid is absorbed and the rice is al dente, about 30 - 45 minutes (I cooked mine on a slightly lower temp for just over an hour).